I know. I haven't been here in a while. But I've been busy. And this book has been sitting beside my laptop for WEEKS, waiting for me to have time to write up a PPBF post for it. And today is that day! And so, I present to you another fabulous book to add to Susanna Leonard Hill's Perfect Picture Book Friday list. First Page:A bit more than three hundred years ago, in an English town called Lyme, a girl and her mother picked wild blackberries. Their hands turned purple with the juice. The thorns of the berry bushes pricked the fabric of their long skirts. 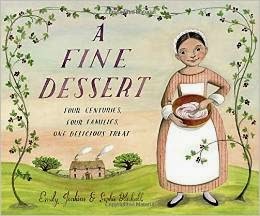 Synopsis (from Amazon): In this fascinating picture book, four families, in four different cities, over four centuries, make the same delicious dessert: blackberry fool. This richly detailed book ingeniously shows how food, technology, and even families have changed throughout American history. In 1710, a girl and her mother in Lyme, England, prepare a blackberry fool, picking wild blackberries and beating cream from their cow with a bundle of twigs. The same dessert is prepared by a slave girl and her mother in 1810 in Charleston, South Carolina; by a mother and daughter in 1910 in Boston; and finally by a boy and his father in present-day San Diego. Kids and parents alike will delight in discovering the differences in daily life over the course of four centuries. Resources: There are fabulous notes in the back from both the author and illustrator about their research that can be used. Talk about all the different changes that are shown from one century to the next - in technology, food, etc. AND of course, there is a recipe for blackberry fool in the book too - make some!! I want to read this one. I need to ask my library to order it. I keep thinking they MUST already have it on order, but I never find it in the list. That task will be added to my to do list today. Definitely worth it. I am actually planning to use some of my barely existing money and purchase this one. Really enjoy the concept and approach in this book, and just about anything Blackall scribbles! I will definitely have to look for more Blackall work. Thanks for stopping by, Julie! I am swooning over this idea of covering four centuries of history in such an amazing way. And Blackall's work is recognizable and wonderful. It is brilliant - absolutely. Thanks for stopping by, Joanna. Very clever idea to follow how a dessert is prepared over four centuries. Kids will find it appealing and be interested in how the technologies change. I must check this book out for a grandchild. I agree - completely clever. I am sure your grandchild will love it as much as I did. Thanks for stopping by! This is such a wonderful and delicious book! Thanks for the great review! You make me want to read it again! You are very welcome - thank YOU for stopping by! I'm glad this PB is getting so much attention. It's a great way to show how things have both changed and stayed the same. Absolutely agreed. Thanks for stopping by, Manju! This book sounds delicious. What a fun way to look at history - through kitchen technology used to make a desert. Clever! Absolutely fun and clever. Thanks for stopping by, Sue! This looks and sounds like a decadent pick; thanks for the lead on this intriguing newcomer. You're very welcome, Barbara - thank YOU for stopping by!